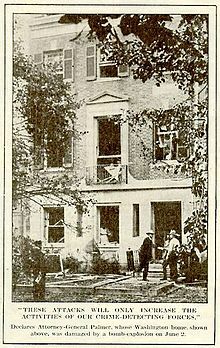 The 1919 United States anarchist bombings were a series of bombings and attempted bombings carried out by the Italian anarchist followers of Luigi Galleani from April through June 1919. These bombings led to the Red Scare of 1919–1920. In late April 1919, at least 36 booby trap dynamite-filled bombs were mailed to a cross-section of prominent politicians and appointees, including the Attorney General as well as justice officials, newspaper editors and businessmen, including John D. Rockefeller. Among all the bombs addressed to high-level officials, one bomb was addressed to the home of a Department of Justice Bureau of Investigation (BOI) field agent once tasked with investigating the Galleanists, Rayme Weston Finch, who in 1918 had arrested two prominent Galleanists while leading a police raid on the offices of their publication Cronaca Sovversiva. The mail bombs were wrapped in brown paper with similar address and advertising labels. Inside, wrapped in bright green paper and stamped "Gimbel Brothers-Novelty Samples", was a cardboard box containing a six-inch by three-inch block of hollowed wood about one inch in thickness, packed with a stick of dynamite. A small vial of sulfuric acid was fastened to the wood block, along with three fulminate-of-mercury blasting caps. Opening one end of the box (the end marked "open") released a coil spring that caused the acid to drip from its vial onto the blasting caps; the acid ate through the caps, igniting them and detonating the dynamite. The Galleanists intended their bombs to be delivered on May Day. Since 1890 and the Second International, May 1 had been celebrated as the international day of communist, anarchist and socialist revolutionary solidarity. Seattle Mayor Ole Hanson, who had recently attained national prominence for opposing a general strike in Seattle, received one of the mailed package bombs, but it was opened by William Langer, a member of his office staff. Langer opened the wrong end of the box and the bottle of acid dropped onto a table without detonation. He took the bomb to the local police, who notified the Post Office and other police agencies. On April 29, Georgia Senator Thomas W. Hardwick, who had co-sponsored the anti-radical Immigration Act of 1918, received a similarly disguised bomb. It blew off the hands of his housekeeper when she attempted to open the package. The senator's wife was also injured in the blast which severely burned her face and neck and a piece of shrapnel cut her lip and loosened several of her teeth. On the evening of June 2, 1919, the Galleanists managed to detonate eight large bombs nearly simultaneously in eight cities. These bombs were much larger than those sent in April, using up to 25 pounds (11 kg) of dynamite and all were wrapped or packaged with heavy metal slugs designed to act as shrapnel. Addressees included government officials who had endorsed anti-sedition laws and deportation of immigrants suspected of crimes or associated with illegal movements as well as judges who had sentenced anarchists to prison. The homes of Mayor of Cleveland Harry L. Davis; Pittsburgh's Federal Judge W. H. S. Thompson; Immigration Chief W. W. Sibray; Massachusetts State Representative Leland Powers; Judge Charles C. Nott of New York; and Attorney General A. Mitchell Palmer, already the recipient of a mail bomb in April, were attacked in the new wave of violence. None of the targeted men were killed, but one bomb took the life of New York City night watchman William Boehner and the bomb intended for Attorney General Palmer's home prematurely exploded and killed Carlo Valdinoci, who was a former editor of the Galleanist publication Cronaca Sovversiva and close associate of Galleani. Though not seriously injured, Palmer and his family were shaken by the blast and the house itself was largely demolished. Two near-casualties of the same bomb were Assistant Secretary of the Navy Franklin Delano Roosevelt and his wife Eleanor, then living across the street from Palmer. They had walked past the house just minutes before the explosion and their residence was close enough that one of the bomber's body parts landed on their doorstep. War, Class war, and you were the first to wage it under the cover of the powerful institutions you call order, in the darkness of your laws. There will have to be bloodshed; we will not dodge; there will have to be murder: we will kill, because it is necessary; there will have to be destruction; we will destroy to rid the world of your tyrannical institutions. The flyer was later traced to a printing shop operated by two anarchists, namely typesetter Andrea Salsedo and compositor Roberto Elia, who were both Galleanists according to the later memoirs of other members. Salsedo committed suicide and Elia refused an offer to cancel deportation proceedings if he would testify about his role in the Galleanist organization. Unable to secure enough evidence for criminal trials, authorities continued to use the Anarchist Exclusion Act and related statutes to deport known Galleanists. Fueled by labor unrest and the anarchist bombings and then spurred on by Attorney General A. Mitchell Palmer's attempt to suppress radical and non-radical labor organizations, it was characterized by exaggerated rhetoric, illegal search and seizures, unwarranted arrests and detentions and the deportation of several hundred suspected radicals and anarchists. Palmer, twice targeted by anarchist bombs, organized the nationwide series of police actions known as the Palmer raids in November 1919 and January 1920. Under suspicion of violating the Espionage Act, the Sedition Act and/or the Immigration Act of 1918, approximately 10,000 people were arrested, of whom 3,500 were held in detention. Of those held in detention, 556 resident aliens were eventually deported. The bombings were dramatized in the 2012 film No God, No Master. The bombing of the home of Palmer was also dramatized in the 2011 film J. Edgar. Ted Kaczynski - Anarcho-Primitivist called the Unabomber involved in a series of similar bombings. This page is based on the Wikipedia article 1919 United States anarchist bombings; it is used under the Creative Commons Attribution-ShareAlike 3.0 Unported License (CC-BY-SA). You may redistribute it, verbatim or modified, providing that you comply with the terms of the CC-BY-SA.